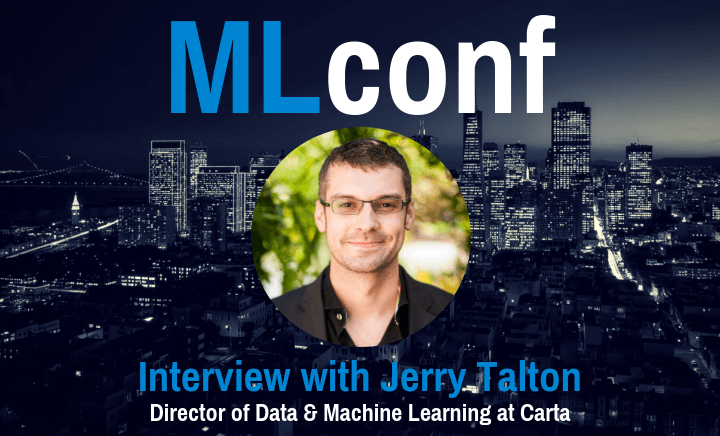 One of our MLconf Program Committee Members, Reshama Shaikh, recently interviewed Jerry Talton, Director of Data & Machine Learning at Carta regarding his recent move to Carta, what they’re working on there, and his upcoming talk at MLconf 2018. RS/ Q1) Tell us briefly about yourself and your work. JT) I’m the Director of Data & Machine Learning at Carta, which means I’m responsible for overseeing the company’s data infrastructure, data science, business intelligence, and machine learning efforts. 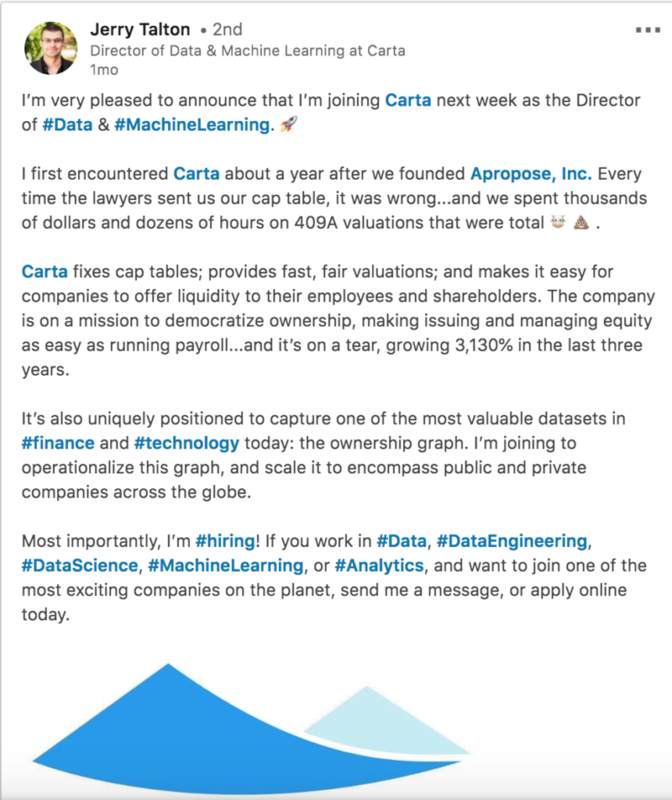 I joined Carta in September after spending almost two years leading Slack’s Machine Learning team in Manhattan. Before that, I was the founder and CEO of Apropose, a data-driven design startup that was backed by Andreessen Horowitz and NEA. 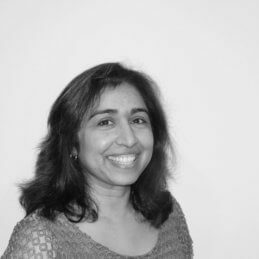 RS/ Q2) You earned a Ph.D. in computer science from Stanford, and you joined Carta recently, in September 2018. Why Carta? JT) I first encountered Carta back in 2015, when I was running my startup. We had maybe twenty employees and half a dozen investors, so in principle managing our cap table should have been easy. In practice, it was a constant source of frustration: every time it came back from the lawyers, it was wrong. Getting a 409A valuation was even more frustrating — and expensive — so we became an early Carta customer. The platform was one of those rare, magical experiences where something I had been worrying about a ton as a founder was suddenly just…taken care of. Leaving Slack was a tough decision, but in the end I found the lure of Carta’s data impossible to resist. Carta is mapping the network of equity ownership (what we call the ownership graph) across employees, companies, venture capitalists, and their LPs. This is a dataset that’s very difficult to get, and we can use it — in anonymized and aggregated ways — to answer so many fundamental questions about startup growth, valuations, equitable compensation practices, fund performance, and more. When you combine Carta’s larger mission of democratizing ownership with its rocket-ship like growth and the opportunities to operationalize the data it uniquely holds, it felt like a once-in-a-lifetime gig to me. RS/ Q3) It was dismaying to read of the deficit that women face in founding support and equity in general in your article Silicon Valley’s Equity Gap: Women Own Just 9%. How optimistic are you about possible change? JT) I think sunlight is the best disinfectant — the first step towards affecting meaningful change is admitting that there’s a problem — and that’s what our work on The Gap Table did. I also think about that Jim Barksdale quote a lot: “If we have data, let’s look at data. If all we have are opinions, let’s go with mine.” Compensation is one of those areas where opinions tend to dominate: companies have to pay tens of thousands of dollars for third-party surveys to tell them about market trends, and the only data employees have to evaluate offers is what they were getting paid at their last job or what they hear second-hand from their friends. If you’re a pre-revenue e-commerce startup raising a seed round, what’s a “market” post-money valuation? If you’re a senior software engineer joining an enterprise SaaS company doing $10M in ARR, what’s a “good” option grant? These are the kinds of questions that are so hard to to answer in a vacuum, but where Carta can help. RS/ Q4) You are hiring at Carta! What skills are you looking for? Who are your ideal candidates? JT) We have a bunch of open positions right now, but the most desirable candidates hands-down are the ones who can build complex software systems and are mathematically and statistically mature. We see lots of talented software engineering applicants, and lots of data science candidates with strong math backgrounds, but if you can do both really well you can write your own ticket. RS/ Q5) Can you list 3 to 5 tips that companies can implement to diversify their employee pool? JT) I’ve hired dozens of people now, and at this point in my career my firm belief is that there aren’t any tips or tricks: there’s no “royal road” to diversity. You just have to wake up every day and do the work and build the kind of culture where all sorts of people feel empowered and valued. One adage I’m fond of repeating is that making a homogeneous team diverse as you grow it is really, really hard; but keeping a diverse team diverse as it scales is much easier. So you really can’t kick the can down the road: there will never be a “better” time to train all your interviewers to recognize unconscious bias, or institute the Rooney rule, or revisit gendered language in your job postings. I also think the tech industry tries to let itself off the hook sometimes by bemoaning “the pipeline problem.” The candidates are out there: finding exceptional people is always a travail, but once they’re there what are you doing to make sure they stick around? Don’t dump your team’s emotional labor on the women you hire; level junior people correctly and pay them what they’re worth; set expectations that microaggressions will be called out on the spot; and most importantly, take responsibility when you inevitably screw up and make someone feel like they don’t belong. RS/ Q6) Would you share a preview of your upcoming talk at MLconf SF on November 14, 2018? JT) The title of my talk is Equity, Inequity, and Machine Learning. I’m going to sketch some of the problems we can use Carta’s dataset to solve, and pose some thorny equity questions we don’t have good answers to yet. RS/ Q7) Here are a few of the trending topics in data science. What are your high-level thoughts, in 1-2 sentences, for each topic. One of the most interesting areas of debate in machine learning right now is whether an algorithm can be “good” if we can’t understand why it’s doing what it’s doing. It’s important to keep in mind that a “worse” algorithm that you can debug may be more useful in practice than a “better” algorithm that’s a black box. Beware mismatched expectations. Participating in a Data Science Bootcamp so that you can use data to be better at your job is a great idea; expecting to be a professional Data Scientist six weeks after writing your first line of Python is not going to end well. Bias, in the statistical sense, is not a bad thing: some of the most powerful statistical estimators are biased ones! The problem comes when we forget that algorithms are made by people, for people: writing something in code doesn’t free it from the context in which it was created. JT) It was my pleasure. Jerry Talton is the Director of Data & Machine Learning at Carta, where he leads the company’s efforts to operationalize the ownership graph. Prior to joining Carta, he managed the Machine Learning Services team in Slack’s Search, Learning, & Intelligence group in Manhattan, and was the founder and CEO of Apropose, a data-driven design startup backed by NEA and Andreessen Horowitz. He holds a PhD in Computer Science from Stanford University, BS and MS degrees from the University of Illinois at Urbana-Champaign, and previously worked at Intel, Adobe, and Nvidia. NextNext Post: Tweet for a chance to win FREE books!